Editor’s Note: This editorial was originally published on NextBillion. 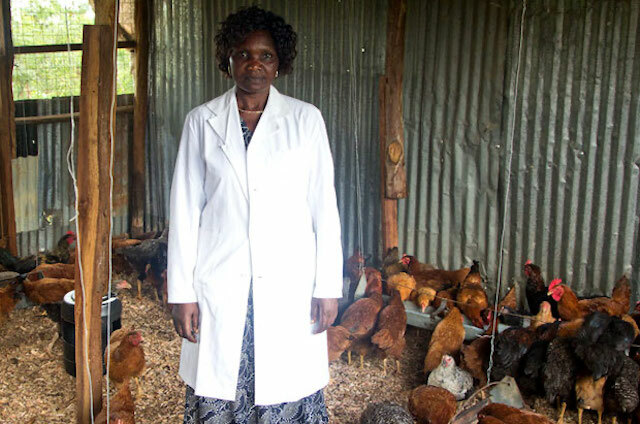 In a small town in western Kenya, Jane Omondi raised chickens for 15 years. She was able to provide her family with occasional meals, but despite her best efforts, she could never turn poultry-raising into a viable business. She would often lose her unvaccinated chickens to disease, making it difficult to grow her flock. Around the world, there are millions of people like Jane – women farmers whose efforts are essential to feeding their families, but who face difficulties increasing their yields. Women grow more than half of the world’s food, and in sub-Saharan Africa they produce up to 80 percent of all foodstuffs. As the world in general, and Africa in particular, have to feed an ever-growing population, it is imperative that women farmers boost their productivity. But women often struggle to access the resources that they need to achieve higher yields on their farms. Lack of decision-making authority, the need to attend to domestic responsibilities, and exclusion from mainstream civil society are some of the obstacles that prevent women from receiving training and adopting new technologies. And it is not just women who suffer as a result: Their families, communities and countries would all be better off if women were better able to access new technologies and techniques. So how can that access be expanded? That was the question that TechnoServe faced when we were planning the Smallholder Poultry Agribusiness Development (SPADE) initiative – a U.S. Department of Agriculture-funded program designed to help poultry farmers in Kenya increase their yields and profits by promoting the use of best practices and modern agricultural technology. Based on the success of that project, we have learned important lessons about encouraging the uptake of agricultural best practices by women farmers. Unfortunately, we know that in many places, women are largely excluded from nominally gender-neutral organizations, like local government and farmer groups. To reach women, then, it is helpful to identify organizations where women congregate and recruit there. In the SPADE project, we targeted our outreach to women’s self-help groups (chamas), women’s groups in churches and professional sectors with high female participation, like teachers and nurses. As a result, between 67 and 73 percent of the farmers mobilized for training were women. Women farmers often face a double burden. They don’t just farm, but also undertake the lion’s share of domestic responsibilities. When designing and scheduling training, it is important to consider those demands on their time. In the SPADE project, we limited training to no more than 2.5 hours per day, and no more than three days in a row. We also recognized that in the communities where we worked, women had low levels of literacy. Training materials were designed to reflect this low literacy level. That said, the training materials were designed to not reinforce gender stereotypes. For example, they depicted women fumigating a chicken coop – something normally considered to be “men’s work.” As a result of these steps, 96 percent of the female farmers who signed up for the program attended all of their training phases. Though women were attending the training, we found that they were not adopting the new practices at the rate we had hoped. We discovered that their spouses, who often controlled household finances, had prevented them from growing their businesses. As a result, we began to include husbands in the outreach, explaining to them how chicken-rearing could be a boon for the household economy. Since we began doing this, we have seen the number of women adopting technologies and techniques increase. In fact, 66 percent of the project participants who have adopted new practices have been women. As the husband of one farmer said, “I did not know that it was this important for my wife to run this chicken business. I wish to be trained, too, on how to care for the chicken, so that I can help better when she attends the leadership meeting.” Close to 6,000 farmers are now practicing modern poultry-raising techniques as a result of the program’s intervention. These farmers have sold chickens and eggs valued at $517,000 in the past 12 months. This is having a real impact on the lives of women like Jane Omondi. When she joined the program, she had just 30 chickens. But she attended the trainings and adopted new techniques, like investing in improved breeds and producing her own nutritious feed, which allowed her to increase the size of her flock and her income. “TechnoServe has taught me how to vaccinate my birds. I had never vaccinated them before,” she said. Her flock grew and she has earned much-needed income by selling her chickens in the commercial market. Today, she has reinvested her earnings and her flock stands at 1,000. With her extra income, she is also able to provide her family with more nutritious food and has paid the school fees so that her son can earn his diploma in community health and development. If we hope to achieve greater food security in Africa and around the world, we need to empower women like Jane. By identifying the obstacles that prevent women from adopting new technologies and techniques, we can help ensure that they are able to grow more food and support their families.